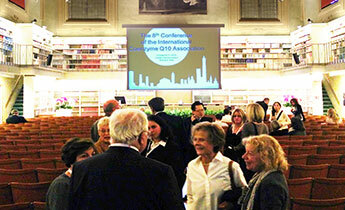 The 8th International Q10 Congress 2015 was held this past October in Bologna, Italy. The conference focused on the theme of what happens with CoQ10 at the molecular level in the body. However, one of the biggest news stories of the conference was the presentation of the results of the Q-Symbio study, a double-blind, placebo-controlled clinical trial. This study demonstrated that the daily administration of Bio-Quinone CoQ10 to chronic heart failure patients improves the patients' symptoms and survival, thus opening the door for a biological treatment that is inexpensive and accessible. The 8th ICQA Conference was a little atypical in that its main focus was on CoQ10’s role in the body's biochemistry and especially on Co Q10's impact on the epigenetics, i.e. the phenomenon that CoQ10 turns on some genes and turns off other genes without its making changes in the DNA sequence. Extensive research on the ubiquinol form of CoQ10 was presented at the conference. This research was predominantly in the form of experiments with cell cultures and mice rather than studies involving human subjects. One ubiquinol study conducted in humans showed no clear improved effect and was unable to replicate previous trials with mice. The conference concluded on a high note with the final research presentation, wich revealed the discrepancy between the actual science of CoQ10's absorption and the recent marketing practice of wrongly positioning ubiquinol CoQ10 products. Renowned international CoQ10 researcher Dr. William Judy from SIBR Research, Inc. presented the results of independent research on the body's absorption of CoQ10. The final presentation of the conference was presented by Dr. William Judy, who has carried out research on CoQ10 since his days at Baylor University, where he worked directly with the renowned CoQ10 pioneer, Dr. Karl Folkers. Dr. Judy’s presentation revealed data from independent research on the absorption and bioavailability of the two forms of CoQ10. Dr. Judy's data showed that there is no significant difference in absorption levels of ubiquinone and ubiquinol and that CoQ10 continuously switches from one form to the other after it is absorbed in the body. Dr. Judy established that there is no basis for claiming that CoQ10 in the form of ubiquinol is a better form than ubiquinone for the human physiology. Rather, ubiquinol will be oxidized and turned into ubiquinone prior to absorption, which means that the body naturally transforms ubiquinone back to ubiquinol after absorption. We note that there are still no clear data that show a better effect from ubiquinol that could justify the somewhat higher purchase price. The reason why ubiquinol is more expensive to manufacture is that it is much less stable than the ubiquinone form and that the raw materials are purchased at a premium because the producer of ubiquinol products has to prevent the CoQ10 from oxidizing in order to preserve the ubiquinol. The most extensive data and the best research on CoQ10 comes from studies done with ubiquinone dissolved in vegetable oil, the exact formula for Bio-QuinoneTM Active CoQ10 Gold.